Home Brother Catch these back-to-back Brother Philippines promos just in time for the new school year! Catch these back-to-back Brother Philippines promos just in time for the new school year! 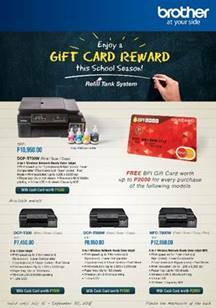 Get in the groove for the new school year with the latest multi-function machines and printers from Brother Philippines—and get exciting freebies that will get you ready for school in style! Brother, a Japanese home and office imaging leader, offers Filipino students, teachers, and families the perfect scanning and printing solutions to meet their demand for clear, beautifully hued print-outs for various needs. The company’s wide array of printers and imaging equipment guarantee fast, reliable, and hassle-free experiences at home and in the office. Still in need of a stylish, functional school bag to start the new academic year right? 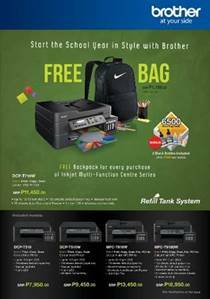 Every purchase of select Brother Inkjet Multi-Function Centre Series machines from authorized Brother dealers entitles customers a free backpack worth P1,195.00! The Brother Inkjet Multi-Function Centre Series offers students the perfect companion for their study sessions. Scanning, copying, and printing documents is made so much easier with thoughtfully added features such as wireless connectivity (available for all models except the DCP-T310), high-volume paper trays, document feeders, single-line LCDs, and more. Machines included in the promo are the Brother DCP-T710W 3-in-1, DCP-T310 3-in-1, DCP-T510W 3-in-1, MFC-T810W 5-in-1, and MFC-T910DW 5-in-1. Customers also get two bonus black ink bottles to print homework, reports, and projects with every purchase of qualified printers. This promo runs from July 10 to 31, 2018, per DTI-FTEB Permit No. 11519, series of 2018. Still have some items in your back-to-school shopping list? Grab a Brother Refill Tank System machine from an authorized Brother dealer and take home up to P2,000.00 in BPI Gift Cards to shop anywhere MasterCard is accepted! High-quality printouts, copies, and scans powered by Brother’s cutting-edge technology is now more cost-efficient with the Refill Tank System Series. And with this new promo, customers purchasing the Brother DCP-T300, DCP-T500W, and DCP-T700W will receive a BPI E-Pay Gift Card worth P1, 500 with each machine, while buyers of the MFC-T800W will receive a BPI E-Pay Gift Card worth P2,000. This promo runs from July 15 to September 30, 2018, per DTI-FTEB Permit No. 12417, Series of 2018. For more information on Brother Philippines’ latest promos or to avail of any of Brother Philippines’ promos, log on to https://promotions.brother.com.ph/. For more information on the company, its technology, and latest products, visit www.brother.com.ph.